Oh my goodness, y’all…THIS WAS SO GOOD! Like, crazy delicious good. In my not-so-humble and always-correct opinion, this is way better than your typical cinnamon roll. I took this to my Sunday School class yesterday. I make breakfast for them every week so they’ve tasted a lot of my breakfast recipes. I think this one was quite possibly the most well-received one ever! They’re always very sweet and complimentary of my cooking, but this dish seemed to garner more admiration than usual. And I gotta admit, this was definitely one of my personal favorites! It’s so sweet and yummy that I’ve been eating a couple of leftover pieces as dessert. Breakfast and dessert often share a lot of common ground. This would be absolutely perfect for Christmas morning. It’s really easy to throw together, and makes your house smell delicious! One thing I was curious about with this recipe is whether or not it could be prepared the night before and then baked the next morning (see update below). I didn’t do that so I don’t know for sure if it would turn out, but it seems like it would be ok. If any of you fabulous and intelligent readers could inform me of whether or not you think that would work (or if you’ve tried it), please let us know in a comment! That is the only thing that could make this dish better for Christmas morning: not even having to prepare it, but just throwing it in the oven. Preheat oven to 375°F. Spray a 13x9-inch (3-quart) glass baking dish with cooking spray. Separate both cans of dough into 16 rolls; set icing aside. Cut each roll into 8 pieces; place pieces in dish. In a medium bowl, beat eggs. Beat in cream, cinnamon and vanilla until well blended; gently pour over roll pieces. Sprinkle with pecans; drizzle with syrup. Bake 20 to 25 minutes or until golden brown. Cool 15 minutes. Meanwhile, remove covers from icing; microwave 10 to 15 seconds or until thin enough to drizzle. Drizzle icing over top. If desired, spoon syrup over individual servings. **UPDATE** Several commenters have said that they tried putting this together the night before, and it worked great! Some said they waited until the morning to pour the egg and cream mixture over the rolls and bake. Others said they assembled the entire thing the night before, covered with foil, and then just had to bake it in the morning. This would definitely be a time-saver on busy mornings, or on a relaxing Christmas morning with your family! Thanks Julie! We loved it! can I bake them in a 9×13 metal pan I have a brunch that I’m doing this Saturday and this would be perfect for that little something sweet. Hi Kellie! A 9×13 metal pan will work just fine. This will be perfect for a brunch! Can fruit be added to this recipe? I was thinking, apples and raisins. What about apple pie filling? I’ve never tried it, but I don’t see why not! Raisins especially seem like it would be an easy addition. I’m not sure about the filling just because I don’t know if it would make it too soggy. You’d also need a larger baking dish as a 9×13 is already full with just the cinnamon rolls. If you try it out, please let us know how it works! I’ve made it as written as well as with pie filling. I spray my pan with Pam, add desired pie filling (blueberry & cherry are my favorites! ), then cut-up rolls and finally the egg/cream mixture. Always turns out beautifully!! Oh. My. Goodness. That sounds amazing. Thanks for sharing! I sure wish that the refrigerated biscuit companies would make whole grain or 100% whole wheat. That would be great! It’s surprising they haven’t done it yet. Will have to try this Sounds like it is really good. I hope you like it, Ellen! Thanks! Hope it’s a hit! Can’t wait to try it…. Has anyone mentioned the fact that its awfully loaded with calories and sugar? I love cinnamon rolls but stopped buying the Pillsberry rolls because they are processed and contain gmo’s. So, while this looks awesome I will not make. I care what I put in my body. Thanks anyway. More power to you. This is definitely a treat and not something I would recommend eating every day (or week for that matter). But I refuse to live in fear of “calories, sugar, and gmo’s” and let that fear prevent me from enjoying food. It’s all about moderation and balance. Just because people eat this doesn’t mean that they don’t care what they put in their bodies, so please don’t be that person who’s all judgey about what other people eat. Sooooo true. Just because we don’t live with food fear doesn’t mean we don’t care. I am very careful about NOT taking caffeine into my body and making sure I have sufficient healthy proteins and vitamins but a life under the fear umbrella could cause you to miss a lot of things… including friends who don’t like to be judged and reprimanded even when it’s anonymously and through the back door. Thanks for this recipe. I agree, Glenda! Food is meant to bring people together and build community. So having such strict dietary rules and imposing them on others hinders that community and relationship building. Well said! I love your response MORE than the incredible recipe! I agree, I eat junk food but in moderation. that is the trick. It’s true as they say everything in moderation. I’m 56 and have been overweight mywhole life so I was always worrying about what I ate. One day I decided to stop worrying so much and eat normal I lost 50 lbs. Congrats, that’s a big accomplishment! Lindsy good you for! What is a judged person looking at “sweet recipes” for? This sounds similar to monkey bread a coworker use to make. She use to cut up the rolls and put in a bowl and let it sit overnight bake in AM. Unfortunately anyone else with a suggestion to the overnight monkey bread? What she said. I lost over 100lbs 30 years ago but do like a treat once in a while. Everything in moderation!! Since I weight 100 lbs and and always trying to gain this is not a problem for me! I will half this recipe and have for dessert tonight! Can’t wait! You could not have said it better Lindsay!! That is why this recipe is posted on a website called “normalcooking”.com. It’s a site apparently for regular recipes that may not always be the most healthy, but like she says, everything in moderation. Sometimes I get so tired of seeing all the recipes for gluten free, vegan, etc… so I’m glad I found this site today, it’s really nice! And I’m making the casserole for my coworkers this Friday! My thoughts, exactly! I’m glad you agree with me that a splurge now and then is “normal” :-). Hope your coworkers enjoy this! Ofcourse it is laden with sugar/calories! It is a cinnamon roll! It is all about moderation and having some pleasure in life. I do not suggest eating a whole pan yourself, but to take to a family function, friends or even work so you can enjoy it without tempting yourself with the whole pan (as I would be for sure!). That isn’t to say I don’t care what I put in my body, because I do. But I also want to have pleasure in my life. That’s how I see it too Diana! Well said, this is a treat and it is already on my list to make when camping with my kids the family this coming October. Two weeks in the woods, hunting and fishing and great camp fires. We eat well, we smoke food, grill food, sometimes cook over the camp fire and we also enjoy. Life is to short not to enjoy at times. Then don’t make. Keep your negativity to yourself. No one cares about what YOU put in YOUR body. Kinda like if you don’t like what’s on TV you change the channel, you don’t complain to the networks (usually). Gramma always said if you can’t say something nice don’t say anything at all. Learn it. Sounds like your Gramma is a smart lady! YOU nailed it and her…. some people just need to get a life and let others live theirs. I’m wondering why you even came to this recipe then?…Just to chastise those of us who will eat this when we want to?…If you wouldn’t eat it, then go comment elsewhere…and if you won’t eat this, goody goody…. These are great and taste delicious whats a few cal’s if you are so pickey why are you even on this site seems like we all enjoy good food. You seem like a great match up wit Michele Obama. Eat enjoy life to its fullest you only go around once. If you aren’t going to make this wonderful casserole, then why even bother posting a negative comment???? If this is a concern for you, you can always use Immaculate brand cinnamon rolls! When you take the rolls out of the can, they will be small and doughy I took a pair of kitchen scissors and just cut them into 8 little pieces I think that’s easier than trying to use a knife Cutting them with the scissors worked great! I used a pizza cutter to cut them….worked quickly and perfectly! Use Pam or butter or oil on the scissors so the dough won’t stick. So, 16 rolls, each roll into 8 pieces? yup! They will fill a 9×13 dish. When taking the cinnamon rolls out of the container,how many pieces if it is a regular size can. I believe there are 8 rolls in a regular can. Can’t wait to try when grandkids stay. Your grandkids are sure to love these! Tey look great, will make nxt week for our Community Coffee at Church. Hope you and your friends at church enjoy it! Just went to buy the ingredients…will be making this Sunday morning The cans of Pillsbury Cinnamon Rolls have just 5 rolls in each can Is that right? I saw the large can of orange rolls right next to them that contained 8 rolls. Please let me know if I need to use more than 10 cinnamon rolls. Thank you! I love your site! I think a regular can of cinnamon rolls contains 8 However, if I’m wrong, I promise 2 cans will be enough! Thanks for visiting my site, and I hope you enjoy the recipe! You are right I bought the small cans which contain 5 each. (The did not have the 12.4 oz. size) No problem, I bought 4 cans just in case…Thanks for getting back to me so quickly. This looks awesome!! I’m gonna “Pin” it! I’ve been looking for something exactly like this for a while. Thanks for posting!! Thank you, Cecile! It’s one of my all-time favorite breakfasts! Even though I don’t like cinnamon rolls,and have been eating healthier lately.I am definitely going to try this recipe.Thank you. Hope you like it Melissa! If you’re gonna splurge, this is some good food to do it with! I don’t think this would work very well if put together the night before, most of the time i don’t open up any canned biscuit or roll product until the last minute because they dry out so quickly if setting out alone and seem to turn to mush super quick if topped with anything for even 30 minutes before cooking. If anyone has tried this and I’m wrong I would love to know, this would be so wonderful to put together the night before and surprise my husband with in the morning, but I’m on to limited of a budget to be able to buy the stuff and test it out and loose an entire meal if it doesn’t work. Sounds like a wonderful recipe though, I’m hoping to find a way to make it sugar-free and serve it for my friends and family. Hi Mandy Your question is exactly one I asked in the post No one has responded yet to let us know if it works trying it the night before If you’re afraid to try the overnight thing, it takes about 30 minutes total to make in the morning So maybe you can still try it if you have time on a weekend or something! I tried this leaving it set overnight in fridge. Do NOT do this. It was awful. The rolls became a soggy mess that never cooked. I had throw it all away. Lesson learned. Oh I’m so sorry they didn’t work out for you! I personally haven’t tried refrigerating them overnight, but other readers have reported that it was successful. Maybe if you tried waiting until the morning to pour the cream mixture over it? Sorry again, I hope you’ll give it another try. Thanks Gabi! I know many people have asked if leaving it in the fridge overnight would work, and I appreciate you letting us know how it turned out! Glad it was a success! Will it taste diffrent without the pecan’s have a grandaughter with tree nut allergys. It would still be delicious without pecans! It just wouldn’t have that slightly crunchy texture, but not a big deal. Try raisins instead of nuts. II would think it will still taste great, I wasn’t going to use nuts as I have a few in the family that have the same problem. For nut lovers I am sure it will be great and for those that can’t have nuts, without nuts, it will be great. Oh yes, it’s definitely delicious with or without the nuts! And if you have some people that like and some that don’t, you could always just add them to individual servings. I would really like to thank you for posting this recipe, it was fabulous! Eventhough it didn’t take long to get ready, I wanted attempt the overnight preparation It worked out great I covered the pan with heavy duty foil before placing it in the refrigerator overnight The next morning everything was still moist and ready for baking It was Great – thanks again!!! Thanks for sharing, Jeana! Hear that everyone? Preparing the night before can be done successfully! sounds delicious. I am going to try mixing it up the night before but just not pouring the egg and cream mixture on until morning. I think that would work okay. Still woouldn’t take much time in the morning. That does sound like a good idea Also, if you’re willing to try it, in another comment, Jeana said that she put the whole thing together the night before and just covered it with foil before refrigerating it, and it still turned out great. Copy and paste the recipe into a word document and try printing it that way. i know I make a sticky bun recipe and I make it the night before and it uses the loaves of bread from the freezer and it cooks up just delish and looks nice. If this helps anyone. I feel it is working with the same material. Thanks Jacquie! It does sound like it would work out the same. Would you be willing to post the sticky bun recipe? I usually use left over bread for bread pudding. Sticky buns would be a change. Thanks! Is this the “regular” cinnamon rolls or the Grands kind that are really big? I would love to make this but am unsure of which Pillsbury rolls to buy. Thank you. Yes these are the regular cinnamon rolls And as you can see in the picture, they fill up a 9×13 once you cut them into pieces so you won’t need to get anything larger. I HAVE MADE THIS AND NUMEROUS OTHER BREAKFAST CASSEROLES AND ALMOST ALWAYS PUT THEM TOGETHER THE NITE BEFORE WITHOUT ANY PROBLEMS. YES I HAVE DONE THIS ONE THE NITE BEFORE,,, EVERYTHING WAS OK.. Thanks for sharing, Ed! That will definitely save some time in the morning! I have tried them by preparing them the morning of and they are delicious!!! So knowing what they should look and taste like, I’ll take one for the team and try preparing it the night before I will prepare Tuesday night and report back Wednesday morning. If they don’t work out I have a 25 yr old son “just like Mikey”, he’ll eat anything I’ll just leave them on his doorstep. haha thanks Sandra! Please let us know what you discover! Glad to hear that they were a hit at your house, Sandy! I know that the consistency of the soy milk will be much thinner than the cream It might make the bread soggy You could try finding a recipe online for soy whipping cream Or maybe try leaving the cream out entirely? Please let me know what you try and if it works out for you! Maybe you could try coconut milk instead, you know, like you whip the coconut cream into whipped cream? i will be trying this with orange rolls…yum…i also think i will try with the frozen kind, flash frozen, single serve from a bag…ill let you know! My church family loved this recipe and were “jumping in the pews” in anticipation of my making them again on Mother’s Day! Glad to read comments regarding doing the prep work the night before Took some time to cut the rolls into 8 pieces (I fixed 2 dishes)! I will try using kitchen scissors next time to hasten the task of cutting up 4 cans of rolls! Thank you for sharing this recipe. So glad your church family loved this recipe! Thanks for giving us your feedback! I made these first with cinnamon rolls They were OK but today I made them with orange rolls & they were wayyyy better! Used the can with 8 rolls. I use the kitchen scissors to make fast work of cutting the rolls This is such a really simple recipe I see no need to start them the night before. I made this wonderful casserole but only put maple syrup on half It was all very good but the side without the syrup was not as soggy I also did not use much of the icing…..it was sweet enough as is Next time I will not use the maple syrup and add either fresh chopped apples or dice a can of peaches just for something different Really looking forward to making it again very soon. Thanks Wendy! I prefer the moisture from the syrup and the extra sweetness from the icing, but to each his own! I do really like your suggestion with the fruit though! That sounds delish! try omitting the maple syrup in favor of mixing your fruit infusing it with maple flavoring etc. oh I definitely like the idea of using fruit in this! Haha thankfully I don’t think anyone has counted up the number of points this would be Knowing the total would probably only depress people! Ignorance is bliss! Can mot wait to try these sound really delicious. We will be trying this but making with it with our homemade cinnamon roll dough, just another step. If it tastes as good as it looks we will be making them and freezing the dough in pans, adding the eggs, cream, etc. after thawing and before baking. Thanks for a great idea. Ooohhh that sounds really good! This will definitely take already delicious cinnamon rolls and make them into an even more delicious casserole! I hope you and your Bible study ladies enjoy this casserole! I just recently got laid off from work so I have time now to go a little crazy in the kitchen, ( my family is enjoying all my new spare time ! ) I tried this for the first time this morning and all I can say is WOW !!!!! It won’ t be the last time I make this and when I get back to work I ‘m making time for this again and again !!! Shellie, I’m so glad you and your family loved this recipe! It’s definitely one of my favorite breakfasts. It’s refreshing to see someone with such a positive outlook on life 🙂 Best of luck to you in the job search, and I hope you always find some time to cook! Maybe I just didn’t read all the comments, but this recipe screams for a can of apples, drained, chopped and added as you did the nuts. That definitely does sound delicious, and like it would be perfect for Fall! I’m not hip to store bought cinnamon rolls, but this recipe was good. I would make again with one slight change for next time. I would bake the recipe in a smaller dish so the casserole would be thicker. Putting in my keeper file. Glad you liked the recipe Missi! Thanks for the suggestion about the thicker casserole I’m sure some people would really enjoy it that way! It’s in the oven now. Minus the nuts due to my little allergy family. Can’t wait to try it! When the recipe says “In a medium bowl, beat eggs. Beat in cream, cinnamon and vanilla until well blended,” do you beat by hand or use a mixer? It’s very liquidy so you can just beat it by hand. Just made it for the first time and my daughter loved it. I decided to split the recipe (which was easy to do) since there were only two of us It didn’t take much longer to make than just baking the rolls and was a lot better We often do potluck at work and sometimes we have breakfast for dinner This will be a wonderful hit with the work crowd too Thanks for the recipe! This is definitely a dish that everyone loves! Thanks for sharing! I’ve added brown sugar and toasted oats to a recipe like this before and it was great. Do you think that would make this one too sweet? Well, you might not be asking the right person. To me, there’s no such thing as “too sweet”! However, if you wanted to add brown sugar and oats, but fear it might be too sweet, you could cut back on the amount of frosting. After reading all these comments I am really looking forward to trying this recipe. I have a family reunion coming up next Saturday and this just might be the right thing to take. Sounds so yummy! Oh this would be perfect for a reunion! It’s definitely one of my favorite recipes on the whole blog! Hope you and your family enjoy it! Oh man, I bet y’all were the most loved Sunday School teachers ever! Those 7th and 8th graders are lucky! Trying for the first time this morning. This recipe is unique and looks scrumptous! It is ez too. This is a Christmas morning recipe! I added raisins with the pecans and pressed them into the roll dough pieces so they wouldn’t burn easily – and thought maybe dried cranberries would be good too if no raisins. Judging from the smell coming from the oven right now, this is a winner. I’m taking it to my church Wed morning bible class and will let you know the response. We need more breakfast recipes like this – unique and tasty – oh yes and ez too. Thanks Dixie! Hope your Bible class loves it! And yes, this would be perfect for Christmas morning too! Bible Class loved it!! I only brought home a dirty dish. I’m going to make this for my fmily next and have a feeling I’ll be making it over and over. Thanks for a great recipe!! I found a pizza cutter to be awesome for cutting these up into small pieces! This weekend I’m going to make this and try putting the pieces in a muffin tin instead of a casserole for portion control….or else I may not share at all! And for anyone who isn’t a fan of syrup (me) I just didn’t add it to the recipe and it seemed fine to me. Oh that sounds awesome! Let us know how it turns out! this sounds much like a basic bread pudding type recipe, except with bread pudding you would add 4 more eggs, vanilla, and sugar. But this sounds good otherwise and prepping it later in the evening until morning should be ok. wow..I made this this morning and it has now been slated for our Christmas breakfast it is incredibly delicious! So glad you liked it Wendy! I made these for a family Christmas and had some left over. They reheat extremely well. I think I preferred the leftovers to the fresh baked. I think this is because the flavors had time to develope more fully. I used the “Grands” and just left 2 out. I baked them for my husband and myself. I found this recipe to be very forgiving so don’t stress out about being exact with the ingredients. We really enjoyed the Cinnamon Roll Casserole. Thanks for the feedback Marlene! After you cut the rolls in eight pieces, what do you do? Do you leave the pieces clumped together in the shape of the roll, or do you separate the pieces and put them randomly in the dish? You just dump them all randomly into the dish. Once you’ve put all the pieces in there, your dish will be pretty full so it’s kinda like one giant cinnamon roll. Hope you like it! Did you use REAL maple syrup or pancake syrup? I used real maple syrup. However, since it’s just a topping and not integral to the recipe itself, you can use whichever you like! I know some people told me they preferred not to use the syrup since it was already so sweet on its own. It’s just a personal preference. This doesn’t end up soggy does it? I have recently tried a french toast casserole that was made very similar and it turned out more like bread pudding!? It was yucko! Mine didn’t turn out soggy, and I haven’t received any comments from readers mentioning it either. So I think you’re safe! I personally hate the texture of bread pudding, and I can assure you this was nothing like that! If you follow the recipe you should be safe, but let me know how it turns out! We always have cinnamon rolls on Christmas morning. We will try your recipe this year! Sounds very yummy. Thanks Carole! I hope y’all love it! I think I’m going to try this instead of our traditional cinnamon rolls for Christmas morning… Except I will omit the nuts (the kids aren’t a fan of nuts in things) and the syrup (the hubs hates syrup, there’s something not right with him! LOL). Well, even without the nuts and the syrup, this will still be a fantastic Christmas morning breakfast! Hope your family loves it! Carolyn, American biscuits are similar to scones without sugar added. I imagine you could make a recipe of them even with the sugar in the dough (depending on how sweet you like it), rolling small bits of dough in cinnamon sugar or cinnamon mixed with brown sugar, and follow the rest of the recipe to good effect. Alternatively, some above mentioned using bread dough. If you don’t have maple syrup, you can leave it off or use a little caramel sauce or cane syrup–it just adds extra sweetening. The icing is simply powdered sugar with a little butter cut in and a little warm water added to thin it before drizzling it over the baked product. Let us know if you try this. I do not have heavy whipping cream. Can I sub 2% milk for the cream instead? Do I need to add anything to the milk if I can sub. it? Thanks! Brooke, you can use milk and butter as a substitute for cream. For one cup of cream, use 3/4 cup milk and 1/3 cup melted butter. Stir the butter into the milk slowly. You can add a tablespoon of flour to thicken it up. Some people recommend letting it sit in the fridge for at least 24 hours to allow it to thicken even more, but it should work fine without having to wait. Hope that helps, and I hope you enjoy this dish! This was so good! Thank you so much! I made this Christmas morning. Mine turned out soggy. I followed the instructions and the top was cooked perfectly but the bottom was completely soggy. I plan on cooking this again, just what do you recommend? Thanks for the help. Oh I’m sorry to hear that it was soggy! I’m wondering if it might be the particular oven you baked it in since I haven’t received this comment before. If the top is cooking faster than the bottom, you might try covering it with foil for a portion of the cooking time to ensure the top doesn’t burn while the bottom has time to cook. Also, you can try reducing the amount of liquid (like the cream and eggs) to keep it from being so soggy. I hope this helps! Please let me know how it turns out the second time! Wow! This sounds so delicious and after reading all the comments I’m going home to make them right now. I think even my picky-eater daughter will like this (although I will have to leave out the nuts). My mouth is watering already. I hope it lives up to the hype! I’m sure you and your daughter will love it! I plan to try this for a dog show breakfast casserole soon. I will be tossing some browned sausage in with the cinnamon roll chunks. But not fruit. I already use apples for another dish that I’ve taken to the last 3 dog shows that our organization hosts… the apple dumplings made with Crescent rolls, butter, sugar, and Mountain Dew. Google Pioneer Woman Apple Dumplings for the full recipe. Those are also great made with peaches. Will try this to preview for our up-coming family reunion. Also for those not wishing to use the thicker cream, there’s a product called “Thick-It” that will thicken the milk to a heavier consistency. It works very fast and uses a small amount and dissolves easily. You could probably also try cream of tartar whipped into the milk(I use it to thicken icing when I don’t want to use so much sugar) ‘m not a sweets eater. but will try this out because it looks easy and sweet enough to please the family. Thanks for the tip! And if you want to cut out some sweetness, you could always leave off the icing and let your family members ice their own individual servings. That way it’s the best of both worlds! I added apples instead of walnuts so I still had a little crunch, it was great. Made night before and it still turned out great. I love the idea of apples in this! Glad to know it worked making it the night before, too. Thanks for the insight! I made this for breakfast today. You’re not kidding! So easy & so yummy! I used one can of Grands in an 8×8 pan and halved the recipe (except for the cinnamon, I only used a half teaspoon as I don’t like a ton of cinnamon), and it worked perfectly! This is quickly going to be a family favorite. Thanks for sharing it! Thanks Jamie, glad you liked it! Sounds like the traditional “Monkey Bread” receipe except the dough is put in a baking dish instead of a bundt pan. It iseir churches.h so nice to see how many people cook for their churches. It is something I enjoy so much. I take breakfast for the teens each Sunday morning and will definitely be making this. They will love it1 Thank you for this wonderful idea! Hi Julie! I agree I love seeing church members cook and eat together. It creates such a community! My Sunday School class loved this, and I hope the teens enjoy it! You’ll love it, I thought it was going to be super sweet, but wasn’t . sounds just divine!!! for some reason.. I kept thinking about some apple as I read the recipe… just a thought for a little variation.. can’t wait to try this one!! Thank you bunches!!! A couple other readers have tried apples in this and given great reports! So I guess I should try that next time! Has anyone tried putting a double recipe in one 9″ x 13″ dish? I haven’t tried it, but I wouldn’t recommend it. One recipe (16 rolls, each cut into 8 pieces) really fills up a 9×13. When it bakes it will expand, and I think doubling it would cause it to spill over! Okay, I have a pyrex dish that is a little larger than 9X13, I think I will try one and a half recipes in it to take to work Tuesday morning. Thank you! You’re welcome! Hope you and your co-workers love it! This looks like a very tasty dish, but I always try to make food like this less calorie and fat laden, so I don’t feel so much guilt at eating something that is really not healthy. While it may be “normal food”, and there is no info on # of calories and grams of fat and sugar, I am guessing it is more than a day’s worth in one serving. An alternative is to use agave syrup, fat free cream and cut down on the icing. Lindsay, when you get older, you will see why it is so important to cut the calories from your diet. You might try suggesting healthier alternatives for your recipes on your web site. I am all for making things lower calorie, especially when you can’t even really tell a difference. If a product comes in a “light” version I will always buy it instead of the regular (and tell my readers they can do the same without sacrificing taste). Your suggestions about agave and fat free cream are good ones. But there is not a one-size-fits-all approach to eating. Everyone needs a different amount of calories based on their activity level and metabolism. Olympians eat two to three times as many calories as the average person, but they’re the healthiest people on the planet. A calorie is a unit of energy, nothing more. There is no such thing as a “day’s worth” of calories, because you burn energy differently depending on what you do. And as far as “healthier alternatives” on my website, there are over 100 Weight Watchers recipes and many others that are low-fat and low-cal. I am not advocating eating treats like this daily. But to go through life thinking you can NEVER splurge on something decadent and sugary is unfair. And like I said earlier, it’s unfair to judge others on what they eat because what is right for one person is not applicable to everyone. I tried it last weekend at a Church Youth Lock-in. The kids loved it!! This weekend I have family in town and making it again. Thanks so much! Thanks for the feedback Donna! Glad everyone at the lock in liked it, and I hope your family does too! I’m already thinking three months ahead, making this for Easter breakfast. If I can wait that long! Is it me or does the bottom get a little eggy? Did I do something wrong? They were great but I wasn’t sure about the bottim because the top was clearly done. Thanks for sharing! A couple of people have mentioned that, and I think it’s just how ovens cook differently. If you think the top is done and the bottom is not, you could cover it with foil and bake it for a little longer. That way the top doesn’t get crispy and burnt but the bottom can still cook. Sorry it didn’t turn out perfectly for you, but I hope it works better next time! Just took them of the oven; and tried them. They are excellent! Everyone loves them! So glad I came across this website…sure to try many more! Thanks Patti! Glad they were a hit. Hope you like the other recipes you find just as much! 9×13 dish piece left when I got up the next morning…my husband and son ate the rest! I melted butter over my piece and sweet Jesus! Good! Haha so glad you liked it! That melted butter addition does sound delicious! I cut the recipe in half as we have a small family. They’re in the oven right now and my house smells so good. I can’t wait to try this, YUMMMM!!!! Oh I just love how my house smells with cinnamon rolls baking! It also makes me so impatient for them to come out of the oven! Okay, this is off my chest and I even used the very trendy hashtags even though I don’t even have a Twitter account, LMAO!!! It’s a good thing that I don’t have a weight problem, because I ate a quarter of it all by myself…and enjoyed every bite. Haha no judgement here! Sounds awesome! I just tried this this morning and my wife and I loved it! I cut the recipe exactly in half for the two of us and used an 8×8 baking dish. So quick and easy and it baked up perfectly in 20 minutes. I used real maple syrup and even drizzled a little extra syrup over mine after serving it. Yummy! Let me preface this with this: I am not a cook, or a baker. I made this this morning to take for our Sunday school class, and was kind of nervous. I’d never made breakfast before! This was so easy to make, and turned out INCREDIBLE!!! I followed the directions exactly and it turned out perfectly! Everyone loved it! Thanks so much for this amazing recipe! Thanks so much Melodie! This entire blog is created just for people like you (because I was the same way! ), and it’s so nice to hear that you are benefiting from it. I’m glad this dish was a hit with your Sunday School class! I would like to make this but I can’t find heavy whipping cream where I live. What can I substitute? You can use milk and butter as a substitute for cream. For one cup of cream, use 3/4 cup milk and 1/3 cup melted butter. Stir the butter into the milk slowly. You can add a tablespoon of flour to thicken it up. Some people recommend letting it sit in the fridge for at least 24 hours to allow it to thicken even more, but it should work fine without having to wait. Hope that helps, and I hope you enjoy this dish! Ty for the recipe. Trying it with canned apples. Kathy. Will let you know. Could you maybe add fried bacon on top? Before the icing goes on? Oh I like how you think! I’m sure that crumbled bacon would be amazing on this. It would add a little salty to the sweet. Super!! I’ve made it as written several times now and it’s always delicious!! I had a few cans of apple pie filling laying around for awhile, so last night I dumped a can of pie filling in the bottom of the pan and proceeded with the recipe – it was amazing!! One of those recipes that you can tweak to your liking and seems to always turn out perfect. Thanks for giving us your feedback! That apple pie filling sounds AWESOME! What a good idea! Glad you are enjoying the recipe. anywhere and for those skeptics out there, they are great, easy to make and as far as I can tell, are fool proof. Thank you so much for sharing the recipe! Do you think it would work if I cut the recipe in half, and put it in a 8×8 pan? Hi Jen. I think that would work fine! I’m pretty sure an 8×8 pan would fit half of this recipe, but if you have a 9×9 you might want to use it just to be safe. The only reason I say that is the cinnamon rolls get way bigger when you bake them! If you give it a try, let us know how it turns out. Thanks! Making this yummy idea for my mother on Mother’s Day! This is definitely one way to show Mom you love her! Here’s a question for you; recently I bought strawberry toaster strudel at a warehouse store (in bulk) because my son showed some interest, and I had a craving for them. Well, my son is done with them, and my craving subsided. However, we have THREE boxes left! I want my freezer back! Do you think this would work for chopped up toaster strudel? Hmmm…that’s a tough question because I really have no idea! I’m guessing it probably wouldn’t work. Toaster strudel doesn’t puff up the way cinnamon rolls do, and I think it might end up being a big a goopy mess. But if you do give it a try, let us know how it goes! I’d love to hear if your experiment works because it could turn out surprisingly great! The result? Interesting. It had a good flavor, definitely a good recipe on your part. Yet, as you could guess, the toaster strudel doesn’t lend itself to as much coagulation as the unbaked cinnamon rolls would, I’m sure. It was more like a jello mold with lots of fruit inside. I also cut the amount of eggs so that it would be less. Was it good? Eh–well, yes. Would I make it again? No. Am I glad to have my freezer back? Definitely. Thank you! Lindsay, I’m putting together breakfast for 100. Just being sure, this is NOT a main course type of thing like a french toast casserole, correct? Hi Shay. I guess it depends on your idea of a main course for breakfast. In my opinion, I think this would be considered a main course. It’s super filling and whenever I make it, I don’t fix anything to go with it. I have this in the oven now for my kids after school snack! Oh April, your kids are sure to love you! What a delicious after school snack! I followed the instructions. Placed the rolls in the graded pan, mixed the other stuff poured it over liked it says, drizzled syrup over them, then placed in the oven at 375…. within six minutes the top of all the rolls were burnt. My oven is new so that’s not the problem and I bake frequently so I don’t understand how this happened….. Is there a trick or something else you are suppose to do? Hi Amy. I’m sorry it didn’t turn out for you! I’m not really sure what happened. Maybe it’s because your oven is new that it cooks a little hotter? Or maybe the rack was too close to the coil? Sorry again, hopefully it’ll be better next time! Where was the rack top, bottom or middle? I would suggest the middle. try using foil! It worked for me and it came out PERFECT. You can see my comment below which explains more! I am going to make this (as it looks great!) Going to leave out the syrup and add raspberry pie filling. I think it will do fine as I am a grandmother and great grandmother and always trying new things for the kiddos! I think the raspberry’s will make it look colorful for Christmas morning. What a creative twist on this recipe! I hope you’ll let us know how it turns out :-). Maybe instead of cream use pudding? Would that work? Hi Michael. I’ve never tried substituting pudding for heavy cream so I can’t say for sure if it would work. But since pudding is much thicker than cream, and also has flavoring, I don’t think that it would. If you do try it, let us know if it works! This looks delicious!!!! We’re going on a winter holiday and I’d love to make a few things ahead of time…has anyone tried freezing it and taking it out the night before?! Looking forward to trying it!! I don’t know about freezing it, Alice but that is a great question! If you try it, please let us know how it turns out! The syrup is optional so you can just leave it out! Maybe some honey or icing? Oh my goodness that sounds amazing! My little guy is autistic and has an aversion to a lot of foods. While he won’t eat cinnamon rolls as is, he loved this! I let him help me make it and he dug right in when it was time to eat. Thanks for the recipe, it is definitely a keeper for our family! I am so glad your little one enjoyed it Lee! I’ve worked with many children with special needs over the years, and I know food aversion with autism is a big issue. Way to go for letting him try new things, and you should be so proud that he was willing to do so! Oh that does sound very Christmasy! Thanks for the suggestions! I never have heavy cream in my fridge? I always sub sour cream!!! Just stumbled onto this recipe this morning on Pintrest, looking for something nice and easy to make this morning as a treat for my Hubby and I. Reading all the comments was even a bigger treat! Have to go and try this right now. Like your website – normal cooking for just normal people, that has a nice ring to it. Thank you, Marie! 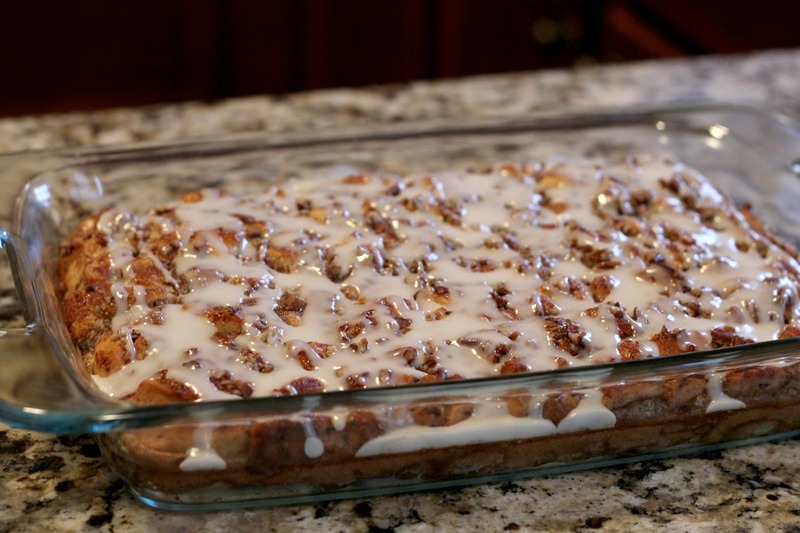 Hope you and your hubby enjoy the Cinnamon Roll Casserole and find many more recipes to try! This recipe sounds great! I’m going to try it for Easter. Just checking, do I need to cover it with foil before baking? Also, is there a special way to arrange the cut cinnamon rolls? Hi Linda! There is no need to cover before baking. And it doesn’t matter how you arrange the cinnamon rolls. Just try to make them even so one side isn’t taller than another. And that’s it! Hope your family enjoys it. I really enjoy the recipes i get and especially from you Miss Lindsay Ballen, i love food and i havellearned to eat right now days, so everything in moderation is right, don’t have to eat like i use to, including the kitchen sink lol! to enjoy great food like yours! My food pallet thanks you! Oh, my comments earlier was meant for The Normal Cooking site, my mistake and thank you again for wonderful recipes Miss Lindsay Ballen! Thanks Terry! So glad you enjoy my recipes! Could I use brown sugar and butter instead of syrup? Hi Roberta, you can actually just leave out the syrup entirely. It’s merely for a little extra sweetness on top! I’m going to make this for company that is coming in for high school graduation. I hope everyone likes it as much as all of the others do. I’m nervous because my boys don’t care for eggs. I’m going to mix it up the night before and pop it in the oven in the morning so maybe they won’t even notice the eggs. You really can’t taste the eggs, just like when you bake them in a cake. I hope everyone likes it, including your boys! This recipe was FABULOUS and was a huge hit in my office. I ended up making it the night before around 8 PM and put it in the oven at 7 AM the next morning. Just a few tips– I ended up baking it for the first 25 minutes with foil on top, then took off the foil for 5 minutes, and then put it back on for another 5. It came out just right by doing it that way. It was a total of 35 minutes baking as opposed to what the recipe calls for. I am assuming it took longer to bake since it was sitting in the fridge over night. I also made it in a disposable aluminum pan. Good luck!! 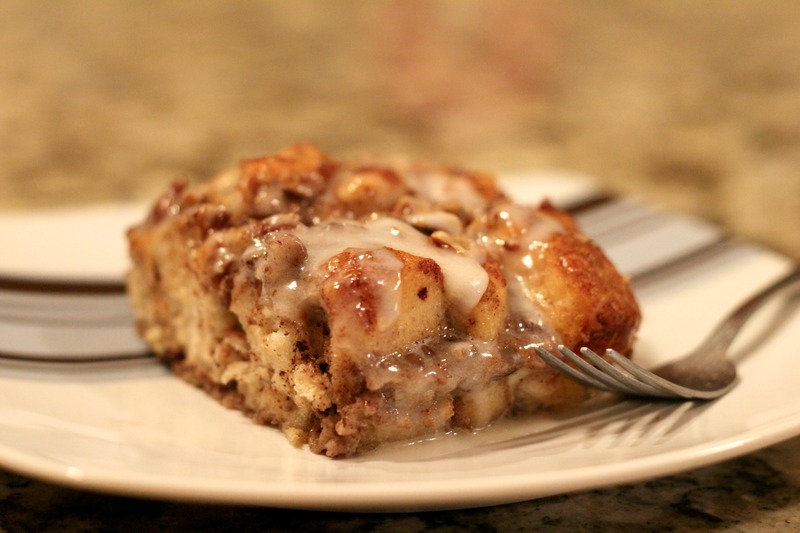 I promise you will LOVE THIS, especially if you are as obsessed with cinnamon buns as I am!